Downloaded release date was Friday, June 21, 2013. This was a Limited in theaters release. 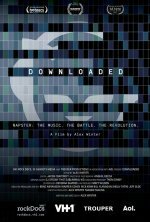 Focuses on the advent of digital media sharing, including the rise of game-changing company Napster and its controversial online pioneers Shawn Fanning and Sean Parker. The digital revolution ultimately created a technology paradigm shift and upended both the music industry and music artists, and changed the world. The film features insights from such well-known artists and figures within the music industry as: The Beastie Boys' Mike D; Noel Gallagher; Henry Rollins; former Sony Music Chairman Don Ienner; former record producer and Island Records founder Chris Blackwell; Sire Records co-founder Seymour Stein; Grateful Dead lyricist, poet, essayist and "cyberlibertarian" activist JP Barlow; Hilary Rosen, former CEO of the Recording Industry Association of America; Harvard law professor & political activist Lawrence Lessig; and other leaders in the world of civil and digital rights.